In front of St Mark’s, supporting three huge flags on holidays, or whenever the city feels like flying them, are Alessandro Leopardi’s bronze flagstaff bases (1505), swarming with a mythological misto del mare of tritons and nereids. Overlooking them, and everything else in Venice, is the Golden Archangel of the Annunciation shining like a beacon atop the 325ft red brick Campanile. Although Venice looks strikingly canal-less from this exalted height, the secretive Serenissima was always very picky about who was permitted to enjoy the view, fearing that spies would peek into the Arsenal, or map the Venetians’ shipping canals through the Lagoon, easily visible at low tide. After all, when begun in 912, the tower doubled as a lighthouse, and even afterwards the function of its five bells was entirely civic. The largest, the Marangona, signalled the beginning and end of the working day, and signalled meetings of the Maggior Consiglio ; next came the Trottiera, or 'trotter' which urged the patricians to make their horses giddy-up to a trot to reach the Palazzo Ducale; then the Nona, which announced noon; the Mezza Terza the opening of the Senate; and the small but ominous Maleficio or Renghiera ('Evil Deed'), rang for an execution. The elegantly classical Loggetta at the base, designed by Sansovino, though intended as a Ridotto dei Nobili (a noblemen’s club), was soon given over as a guardroom to the Arsenalotti, 50 of whom showed up as volunteer (and apparently, totally unnecessary) policemen whenever the Maggior Consiglio met. In the 18th century, it became the centre of the state lottery. 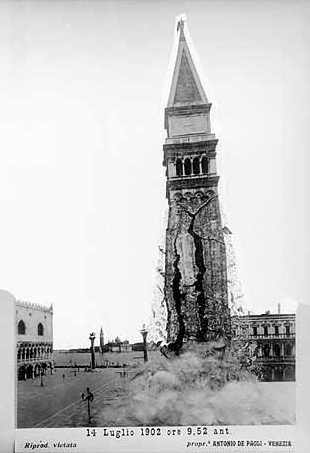 The Campanile has looked the same since 1515, only what now stands is an exact replica, made after the original one considerately warned everyone out of the way by opening a big crack, then genteelly collapsed into a pile of dust on 14 July 1902 (the only casualty was the keeper’s cat, who had run in to check his bowl). 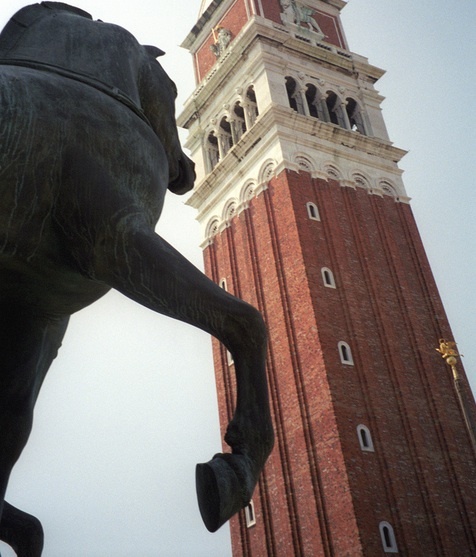 You can buy postcards of a cleverly rigged photo that looks as if it were taken as the Campanile falls; others show what the piazza looked like without this lumbering landmark. The fact that it actually looked rather better, St Mark’s and the Palazzo Ducale no longer obscured and outscaled, had no bearing at all on the decision made, the very evening of the Campanile’s demise, to construct it dov’era e com’era (‘where it was and as it was’), only this time several tons lighter, and stronger. The whole world chipped in (Pope Pius X paid to have the smashed bells recast) and the Campanile was officially reopened in 1912. Although the Pietra del Bando diverted the cascading rubble from St Mark’s, the Loggetta was completely smashed; like a jigsaw puzzle it was pieced back together, along with Sansovino’s allegorical statues and reliefs. As the Loggetta was built during Venice’s brief tenure over Cyprus, these includes a marble relief of Venus (who was after all born on Cyprus) on the attic, keeping company with Justice (Venice’s favourite persona) and Jupiter, native of another Venetian possession, Crete.